I consider myself to be a savvy internet user; I’ve shopped at eBay and Amazon for years, I do my banking and investing online, pay my bills, etc. I’ve also designed e-commerce experiences and workflows–so it’s safe to say, I have some serious expectations of how certain things SHOULD WORK. If you look towards the bottom of the screen, there is a column labeled “View Balances,” with the last link called “Loft Card”. That’s what I need to click on, and I should a screen similar to my AMEX statement online or my bank account. Right? No, click the link, and this is what I encounter (see screenshot). 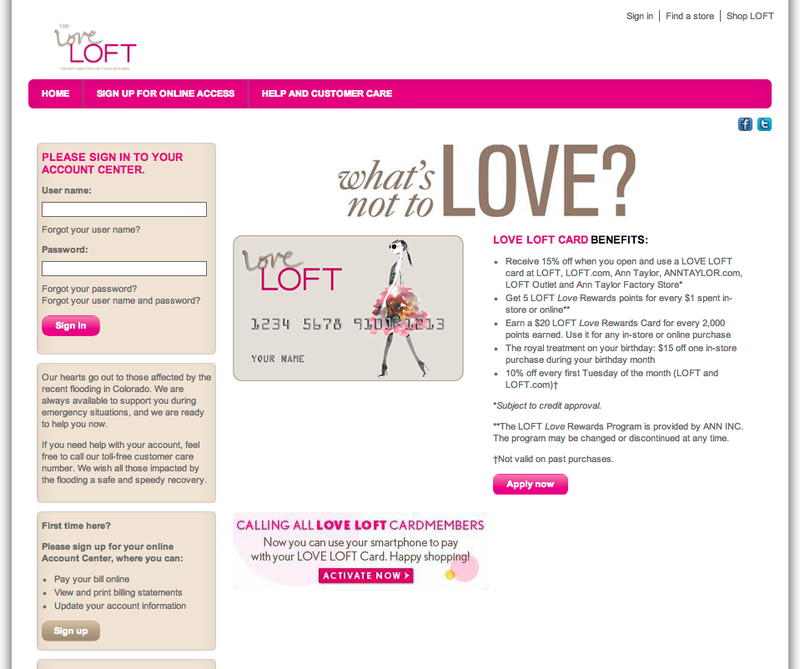 My first thought, “Did I just get redirected to the home page (of the site) and I’m being encourage to sign up for a Loft card?” My second thought, “Is this (Loft Card) link incorrectly linked?” I click the browser back button to return to the My Account landing page and begin clicking other links on the page. Everything I clicked on behaved accordingly; I click on the “Loft Card” link, and the same bright-colored, happy page as before. I proceed to click the browser back button (again), click a few more links on the account landing page (test, test, test), then click the Loft Card link again, with the same results. Definition of insanity. Now I’m annoyed. This shouldn’t be taking as much time as it is. This is a common scenario, it shouldn’t be this mysterious. There is NOTHING OBVIOUS on this page indicating what I should do, given my expectations. I scan the page again, more intently, looking for anything that might help me figure this out. Somewhere in the back of my mind I recall that the email reminder was sent from “Comenity Bank-LOFT”. Maybe this whole Loft card thing is managed by a separate bank? Maybe I have to log in to manage my card, separate from the shopping site? Ermahgawd. New page opens over the one I was just on. COMPLETELY. NEW. UI. 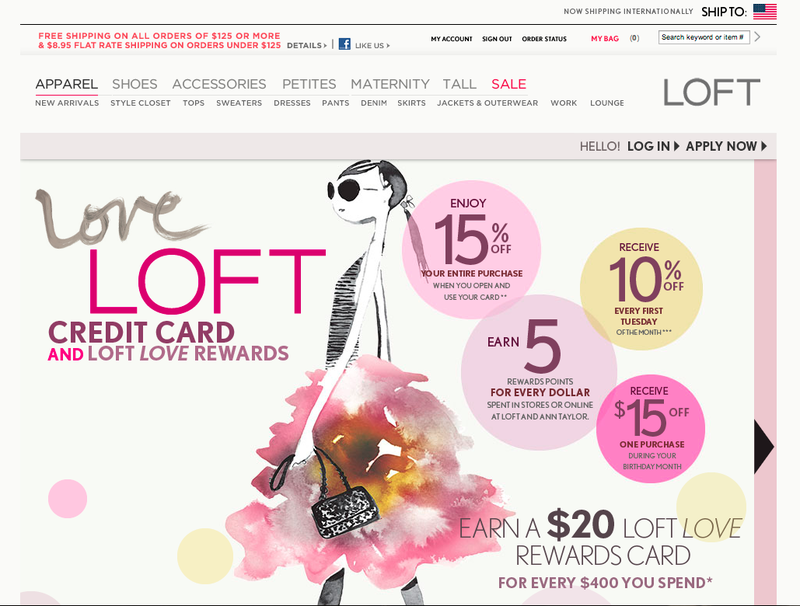 “What’s not to Love?”(I am not “Loving Loft” at this moment.) I eventually get to the page where I can pay my bill. But not before I thought about looking up a phone number to make the payment over the phone, or getting in my car and driving to the store. I came away feeling like I been in the center ring of a 3-ring circus – and no net. 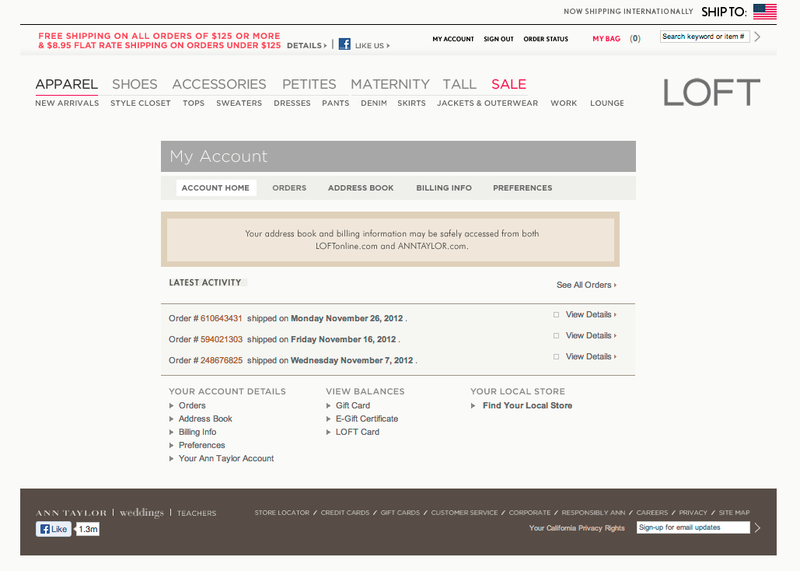 1) Link directly from “Loft Card” to the actual sign in page (above). Also, consider adding “Loft MasterCard” and “Apply for a card” links to the same column. 2) Make it more visually consistent with the rest of the website for continuity and to reduce potential visitor confusion. If anything, add text to the landing page that helps direct the visitor, such as, “Already a card holder, sign in by…” It seems obvious, but it’s amazing how small details are so often overlooked.